Much of the Schoodic Peninsula is part of Acadia National Park, including the Schoodic Woods Campground with ample day-use parking, restrooms, and a seasonally staffed ranger station. A picnic area and restrooms are available at Frazer Point. Please note that RVs are not permitted on the Schoodic Loop Rd south of Schoodic Woods. Schoodic Institute, a nonprofit organization that advances ecosystem science and learning for all ages, manages the Schoodic Education and Research Center at the southern end of the park’s peninsula. Be very careful walking at Schoodic Point where the footing is uneven and can be slippery, and the waves can be erratic. Call 207-288-3338 for more information. 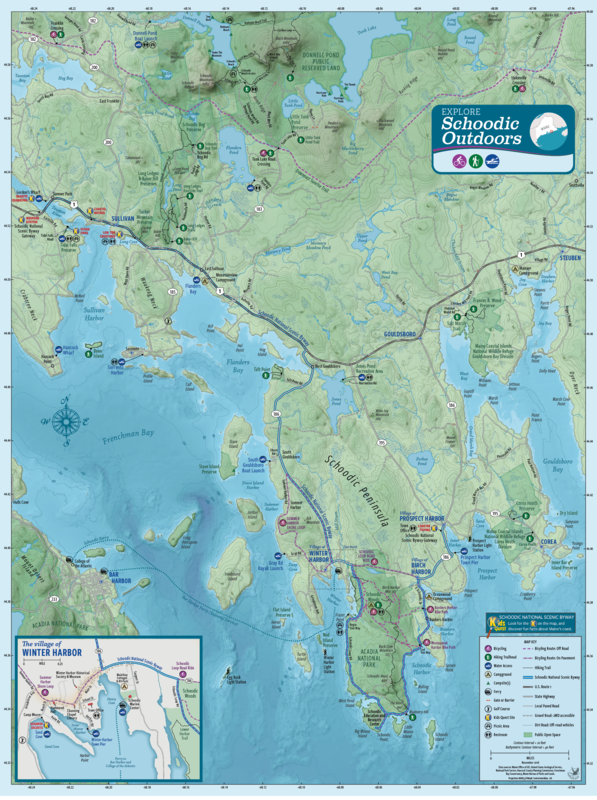 Kids Quest: Look for “Kids Quest” sites along the Schoodic National Scenic Byway. Each of the 7 beautiful outdoor locations will engage children and their parents in the region’s history, ecology and culture. Whether kids climb aboard the small-scale lobster boat in Prospect Harbor, learn about tides at Tidal Falls in Hancock, or explore the shore in Winter Harbor, it’s sure to be fun. A Bird Watching Hot Spot: The National Audubon Society lists Acadia National Park, including the Schoodic Peninsula, as one of Maine’s birding hot spots with a list of more than 230 species ranging from the winter wren of deep forest to the osprey nesting on the coast. Schoodic Institute, located near Schoodic Point in Acadia National Park, offers many birding tours and volunteer opportunities, including a “seawatch” in the summer. The Ferry: Private passenger ferries operate seasonally between Bar Harbor and Winter Harbor. The Island Explorer provides ground transportation from the ferries to Acadia National Park and local communities on both sides. The ferries and Island Explorer can carry a limited number of bicycles. The Island Explorer: This fare-free, propane-powered bus system serves the park and the villages of Prospect Harbor and Winter Harbor between May 25 and Columbus Day. Call 207-288-4573 or check their website. Tidal Falls Preserve: At this narrow opening between Taunton Bay and the ocean, the water races in and out with the tides creating a “reversing falls” (suitable for paddling by experts only). Headquarters for Frenchman Bay Conservancy, it is a great place for picnicking and wildlife viewing. Gordon’s Wharf: In the Town of Sullivan, this historic wharf served ships that carried local granite paving stones to cities up and down the east coast. The site serves as the Kids Quest granite quarry exhibit and headquarters for The Friends of Taunton Bay Group. There is also a float for small boats, and a hand-carry launch where small boats can enter Taunton Bay at high tide. Also visit Sumner Memorial Park (just before Gordon’s Wharf) with its gazebo, sculpture (thanks to the Schoodic International Sculpture Symposium), memorial, old granite horse trough, and granite garden. Village of Winter Harbor: A small coastal town, home to restaurants, shops, cultural events and special outdoor spots. Park in the lot next to the Town Office on School St and bike or walk the village. Consider arriving by ferry from Bar Harbor and view the Schoodic Institute’s marine exhibit in the ferry building. Check out the local fishing fleet at the Town Pier and take the kids to the Camp Moore Kids Quest site. Enjoy historic sites such as Hammond Hall, the Historical Society and the Channing Chapel Library. Picnic at Frazer Point on the Schoodic Loop Rd and enjoy great views of the village. Village of Prospect Harbor: The Schoodic National Scenic Byway ends in Prospect Harbor a village in the Town of Gouldsboro where points of interest are in walking distance. Have a look inside the Dorcas Library and then walk down to the Town Green with its impressive sculpture from the Schoodic International Sculpture Symposium. Head down to the town pier by car to see The Prospect Harbor Lighthouse. Village of Corea: This picturesque coastal village rests on a peninsula at the end of Gouldsboro Bay. The small community is built around its fishing harbor. Home-based artisans are part of the mix.